A couple of days ago I received a BiKN for iPhone case and tags, with just over a week between ordering and it arriving on my desk, considering the big body of water in the way, I was pretty impressed by the rapid delivery. BiKN is advertised as a smart case that allows you to "Find your stuff". Effectively it's a wireless based sensor network which makes use of tags and uses your iPhone as the hub of the network. I was also fairly impressed with the packaging, which had be designed so that the instructions on how to charge and use the tags and case were just there. You didn't have to go looking. Everything also seemed to come fully charged, which is always nice. The inside of the box cover has the instructions. Plugging my iPhone into the case the standard iOS prompt to download the app associated with the accessory from the App Store popped up. Clicking on it took be directly to the BiKN app as you'd expect. It all worked as advertised. However there is very little information about how the system works on the BiKN site, so I took one of my tags apart to find out. I was curious about whether they were using an 802.15.4 mesh network, active RFID, or something else. It turned out my hunch was correct and BiKN are using a 802.15.4 network between the tags and the phone case. For those of you in the Maker world, that's the same underlying protocol as the Digi XBee chips use. However BiKN us using a Jennic chipset instead of the, almost ubiquitous, Digi one. Taking a BiKN tag apart. There are really only two identifiable ICs on the tag's board. The first is a 4MB MXIC MX25V4006E Serial Flash package, providing a Standard Serial Interface x1 or x2 I/O, Single I/O or Dual I/O, at single 3V or 2.5V power-supply voltage. One side of the BiKN board. 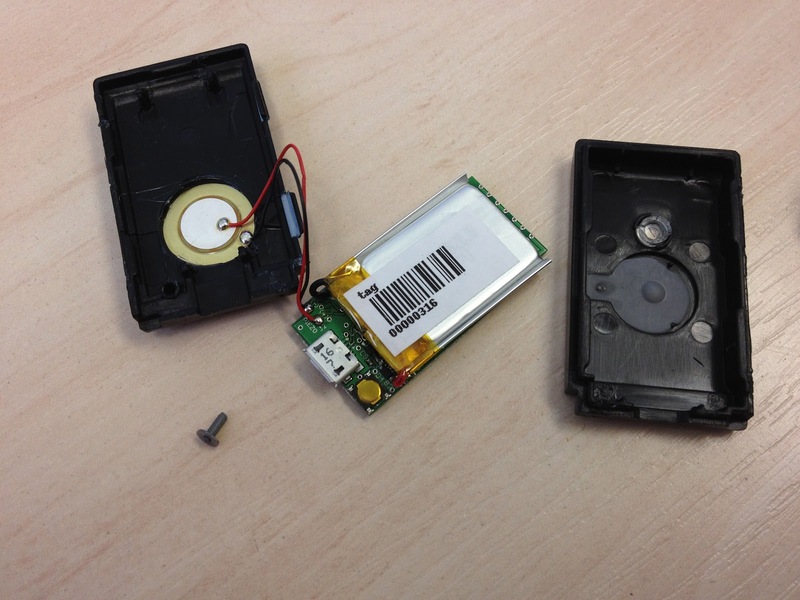 However the really interesting find is visible when you lift the battery. 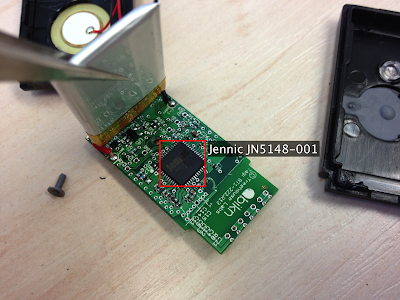 The tag is running from an Jennic JN5148-001 wireless micro-controller. It is a 32-bit RISC processor, with both 128kB of ROM and RAM onboard to support the 802.15.4 networking stack an on-chip user applications. It looks like the BiKN uses a JenNet-IP based networking solution. This is essentially a enhanced 6LoWPAN network so it's extremely generic. I'm going to be surprised if tags are the only hardware to get BiKN-enabled in the future. This is a serious bid to build an (at least semi-) standards-based Internet of Things from Treehouse Labs. The other side of the BiKN board. It's a nicely set out board and interestingly, if you look at the side holding the flash package, there seems to be exposed Rx and Tx lines on the board. Which sort of hints that some sort of serial access might be available. 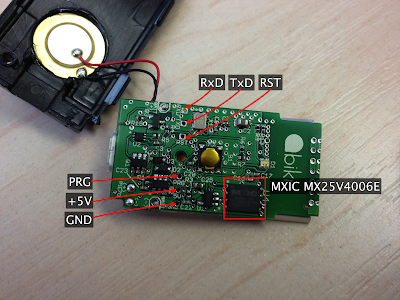 I'm presuming these are going to be a serial pass-through for the micro-controller, but I could be wrong. The only real criticism I have at this point is the build quality. In fact I'm very disappointed with the quality of the materials that they've used. The case feels cheap and plastic, and the tags are bulky and likewise have a cheaply-made plastic feel. These don't measure up the iPhone build quality at all. I was expecting a much nicer rubberised look-and-feel. I don't normally use a case with my iPhone, the phone itself is very hard to scratch and lives in my pocket with my loose change without any (well much to speak of) damage. I was hopefully I could live with the BiKN case well enough so I could leave it on my phone all the time, but it's bulky and cheap plastic feel has ruled that out. The case will have to live on my desk and that means I'll have to swap the phone in and out of it when I want to use BiKN. Which probably means I'll use it a lot less that I otherwise would have done. My only other problem at this point is that, about two times in five, when I open the BiKN app it fails to register the presence of the hardware case. Those times it does register, the case battery life shows to be fairly healthy, so despite the suggestion to charge the case to rectify this, I don't think that's the problem. I've been in touch with the company and they're suggesting this might be a general problem that they're going to address with a forthcoming firmware update, so hopefully that's just an initial teething problem that's going to go away. Their choice of micro-USB connector for the case, rather than a 30-pin pass-through, is also a bit irritating. I can see why they did it, having been involved around the edges of Apple's MFi programme in the past, I'm presuming using the patent laden 30-pin connection could seriously reduce their margins. But I've got lots of spare 30-pin cables around, and not many micro-USB ones. Charging the phone, and the case, is therefore somewhat problematic. Finally then, I'm going to be really interested to see if they come out with a publicly available SDK, as I think that'll be the make-or-break for the product. It's moderately interesting without it, but with a decent SDK so developers can integrate it into their own apps? That's much more interesting. At this stage of the product they should be looking for network effects, but they should be looking for them from the developer community, not end-users. A public SDK would go a long way towards filling what seems to be a gaping hole in the product right now.